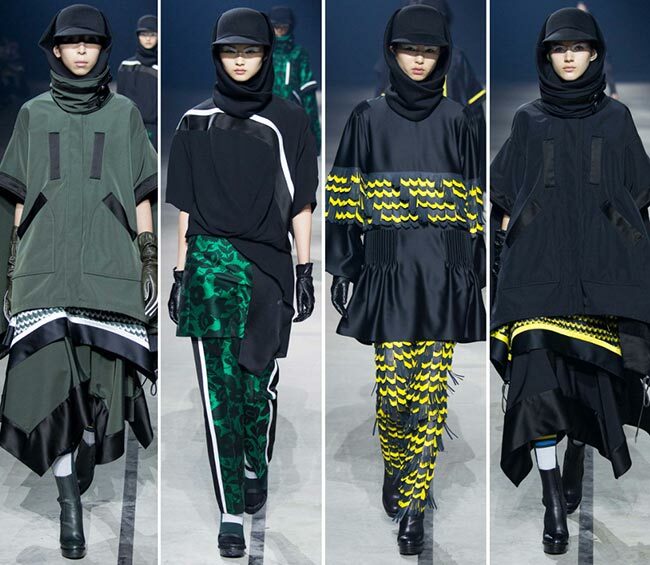 Layering is in for Paris Fashion Week and no one speaks that language better than the Kenzo fall/winter 2015-2016 collection staged yesterday. 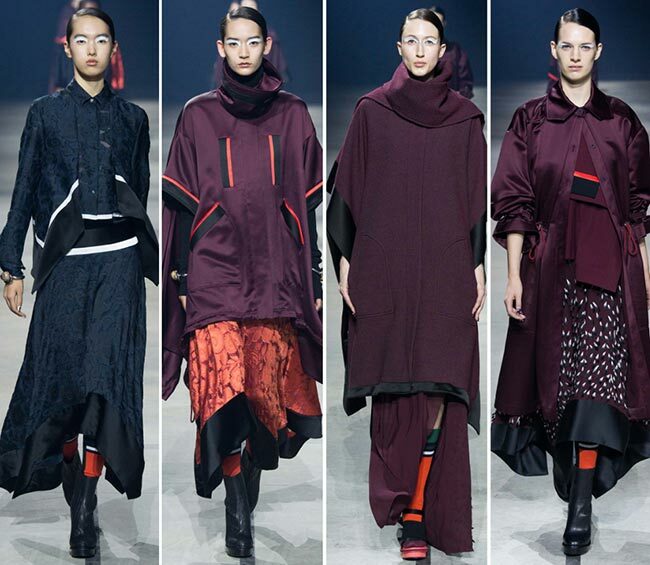 It was an interesting show and one clearly geared towards providing Instagram opportunities as Carol Lim and Humberto Leon capitalize on the use of social media to further grow the popularity of a fashion house. The staging of the show in itself was a form of art it appeared, with a large striped background at the tail end of a huge warehouse spaced out on the Peripherique one six separate columns on wheels with a holographic treatment on three sides and each one operated through the use of Wi-Fi. The first model seemed to be moving the wall, which followed her, breaking apart and showing its choreographed movements throughout the show. Sometimes the setting of these events is almost if not more important than the pieces showcased themselves, and in this case, we needed something to detract from the crazy amounts of layers used within the collection on each model alone. 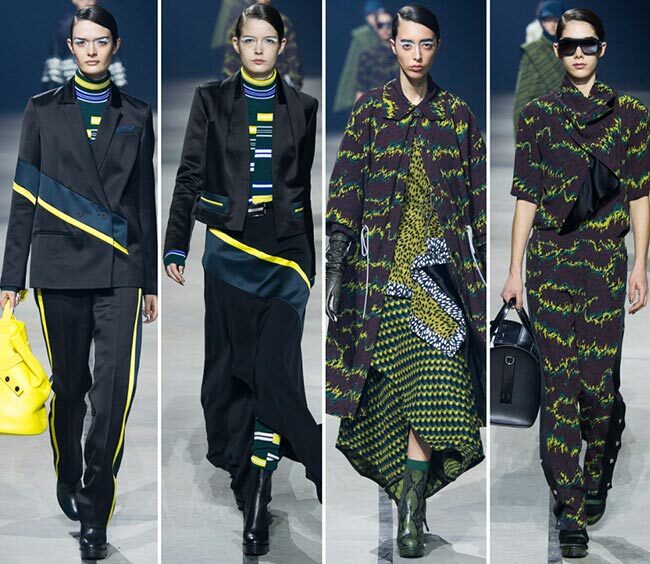 While the Kenzo signature has always been the use of prints, we have been faced with a collection bereft of this design style for a season now. 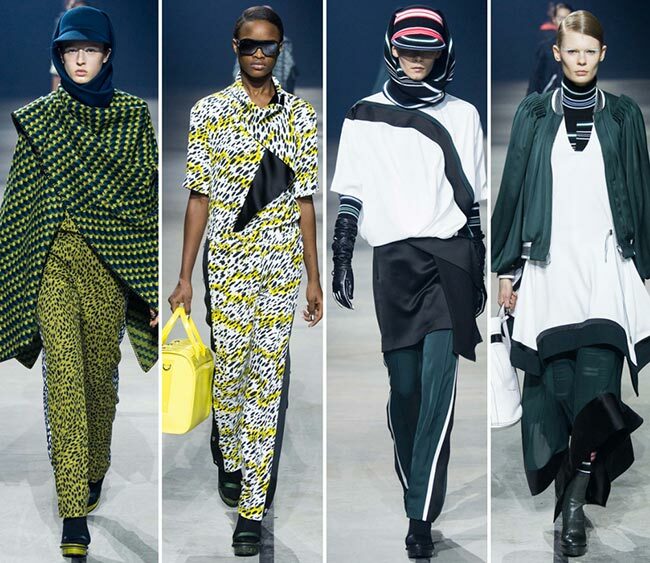 Yesterday, Kenzo brought it back full-force, with all its intense coloring and major contrasts. Plus, it seems that Lim and Leon hold a special love for leopard prints, which appeared all over the runway, in full jumpsuits, sports pants and matching jackets, some appearing to come from dry land and others taking on the unique glow and coloring of the sea with algae at the bottom. 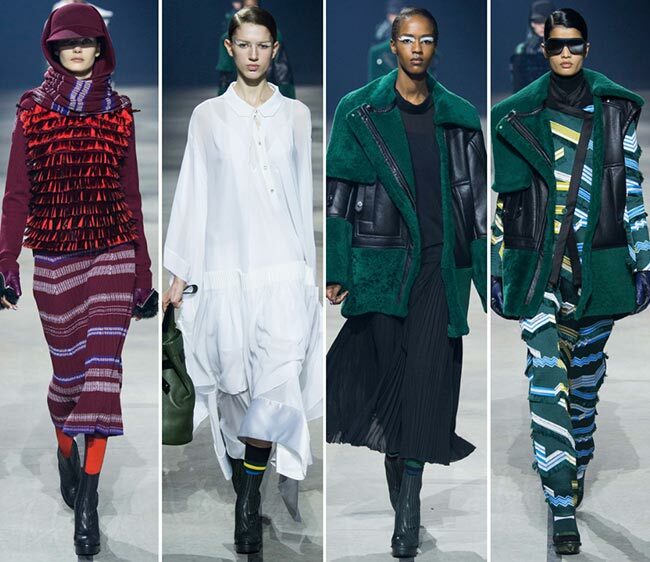 The trees also served as major inspiration for the Kenzo fall/winter 2015-2016 collection, with the forest becoming a monolithic green wall before which stood the Kenzo woman in tent-like layers of green and black. The wall spun around and followed all the models as they made their way down the catwalk, a rather interesting play on illusions and the human need for entertainment in everything he or she witnesses. 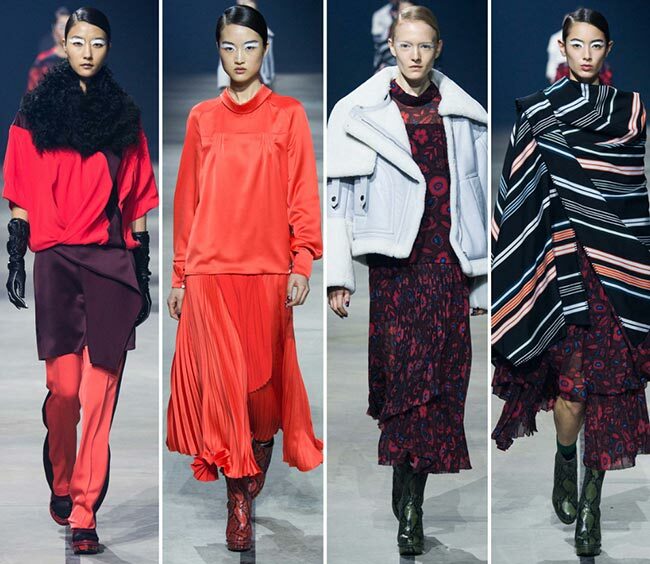 The collection itself was interesting enough and it does appear that the brand is doing much to up its ante. This includes layering oversized shearling vests with long and fluid dresses that are perfect for the days we wake up to the sun shining over our beds, but not quite warm enough to protect against the fall and winter elements. 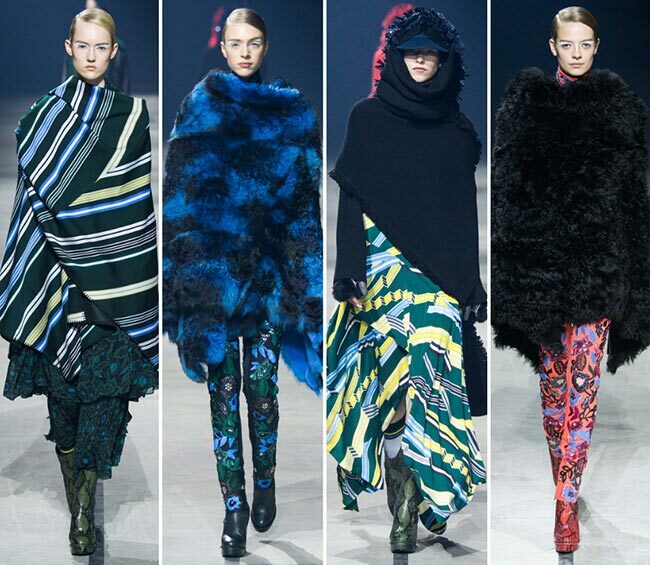 However, the brightly patterned wraps and knitwear will do well to ward off the chill, while the looks had a playful edge to them as well with the owl feather ornamentation and the stripy fringe on the trousers. Even the baby doll tops were not spared a little flirtatious pick-me-up. Nor can we miss the layers of floral jacquards and blanket-stripe shawls that were nice embellishments to a rather unique line-up of designs that will soon hit the rack. 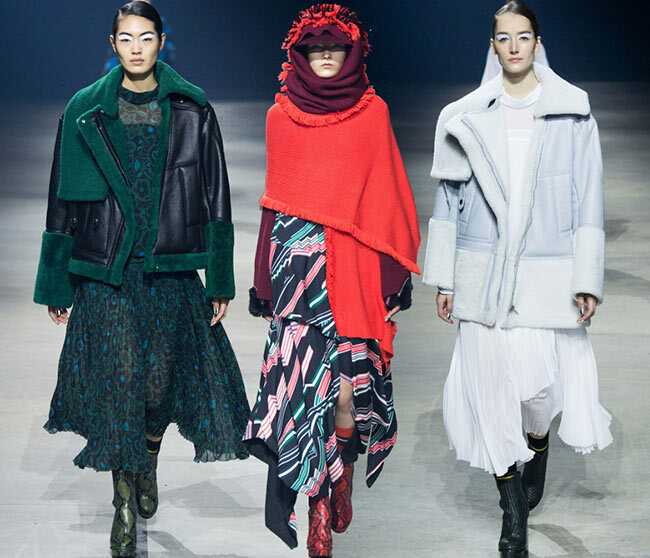 The plastic paillettes may not have been the most appealing, but the Kenzo girl will probably be able to ward off the cold better than most with her shearling lined leather motorcycle jackets and vests, or even the large poncho anoraks that keep the body nice and snug underneath. Bring on the cooler weather, baby, for we are currently already battling the last days of winter as it is.